Whilst the Orbit pram system has eluded Australian buyers, it certainly has captured our imaginations. In the three years since its release, the Orbit has been embraced by celebs and design-conscious parents alike, all loving a slice of the high-tech pie it brings to parenthood. Now the second-generation model has been released – the Orbit Baby G2! The best thing about this model is the mechanism which lets you simultaneously rotate and recline the seat. Baby too stimulated by the sight of a parent at sleep time? Turn him around, lie him down and off you go! Orbit Baby has many other features to make life easier. The hard-shelled seat is well-ventilated via openings in the back, it has a second-to-none suspension system for a smooth ride and the tyres are hardy but require no pumping. Those who already have the system will be relieved you can add the new seat on to a Gen One frame – all parts are compatible! 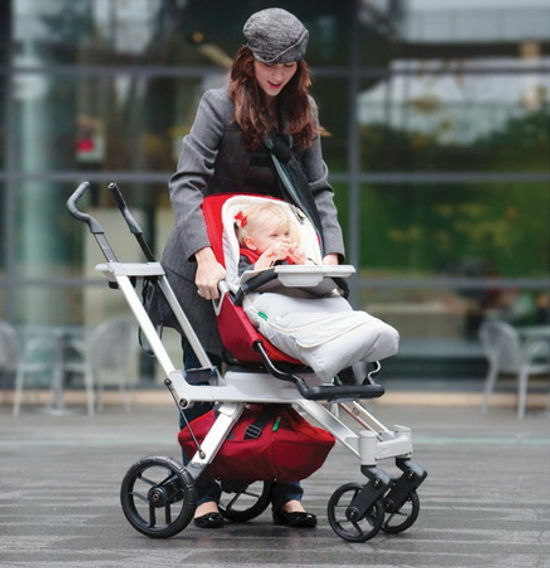 There are three colours – ruby/red, black/slate and mocha-khaki – and it’s the very first stroller with all fabrics and foam certified to Oeko-Tex Standard 100. The rain cover is also PVC-free and the footmuffs are made from organic cotton and wool. You can read more about this at Orbit Green. We saw this pram when it was still a concept last September at the ABC Kids Expo in Las Vegas. Have a look at this demo video with Joseph Hei, CEO and co-founder of Orbit. No word yet on whether the G2 will make it to Australia but we can live in hope. The fact it comes in red is enough to sway me!